How much has extreme poverty fallen in emerging markets since the early 1980s? 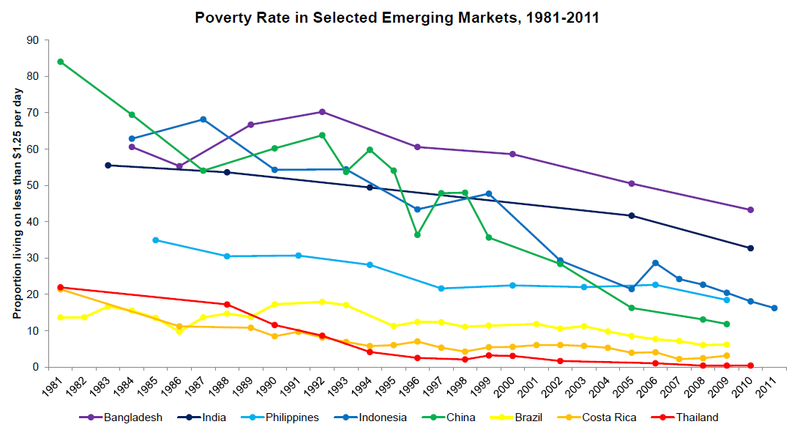 The chart below plots the poverty rate in selected emerging markets between 1981 and 2011. Here, the poverty rate is defined as the proportion of the population living on less than $1.25 per day, adjusted for inflation and PPP. (Data are from the World Bank.) There has been a spectacular reduction in extreme poverty, of which the Chinese experience is the most remarkable. In the early 1980s, when Deng Xiaoping began farm privitisation, more than 80% of the population were living in extreme poverty. As of 2011, just over 10% of the population were living in extreme poverty. The Chinese population averaged about 1.2 billion over this time period, which implies that roughly 800 million people (more than twice the U.S. population) have been lifted out of extreme poverty in China alone. Has Joe Average fallen back in the United States since the late 1970s? In a generally clear-headed article entitled The West is Losing Faith in its Own Future in the FT today, Gideon Rachman writes, "Joe Average – once the epitome of the American dream – has fallen back, even as gains for the top 5 per cent of incomes have soared". Indeed, this chart from The Economist shows that median household income has barely risen in the United States since the late 1970s. Is this a fair picture of how living standards have changed in the United States over the last few decades? In a paper published last year entitled A "Second Opinion" on the Economic Health of the American Middle Class, Burkhauser et al. argue that it is not. They analyse income data from the Current Population Survey between 1979 and 2007. Specifically, they estimate income growth for the median household under different sets of assumptions about what counts as income and what constitutes a household. Their main results are shown below (the table is taken from the original paper). When a household is defined as a tax unit and only pre-tax, pre-transfer income is considered, income growth for the median household was only 3.2%. 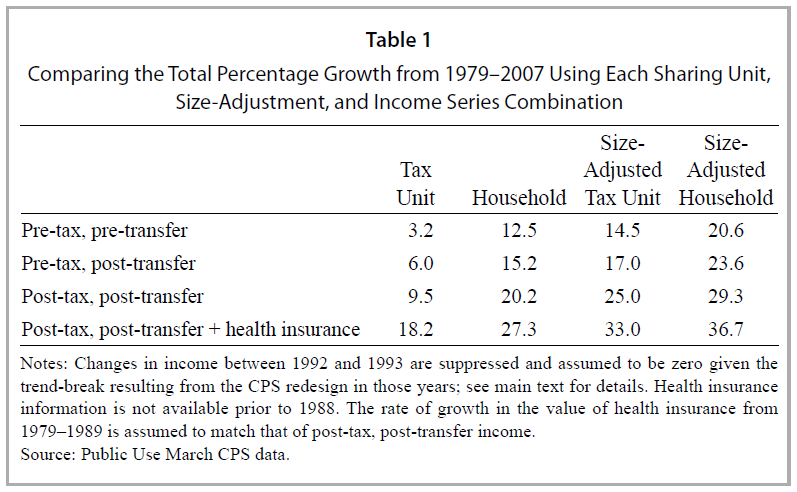 However, when a household is defined as a size-adjusted household, rather than a tax unit, and post-tax, post-transfer income plus health insurance is considered, income growth for the median household was 36.7%. Burkhauser et al. 's conclusion is as follows. "For researchers interested in how middle class Americans are compensated for their time in the labour market, for example, it is more appropriate to use pre-tax, pre-transfer (market) income, although even here researchers who ignore the dramatic increase in the ex-ante value of employer health insurance will understate the returns to work in the United States [...] However, for those interested in the overall economic resources available to individuals, it is more appropriate to consider income defined as broadly as possible [...] As we have demonstrated, doing so provides a markedly different picture of how middle class Americans have fared over the past several decades." One caveat is that Burkhauser et al. only analyse data up to 2007, i.e., prior to the loss of income that occurred during the financial crisis. If they had analysed data up to 2012, income growth for the median household would probably have been slightly lower in most or all of their categories.